Summer time..... and all of August's work and pleasures. 10 very large, seriously piled sky high wheel barrow loads of pruning the yard portion of our 2 1/2 acres of grassy lawn and fields. 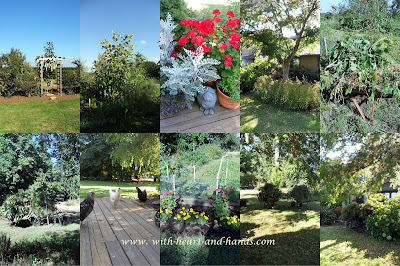 A home that some jokingly call 'the farm' because of the free ranging chickens, the hard work we have to do keeping it up, our prolific garden, fruit trees and berry bushes. So much hard, hard work but so much natural beauty even in the piled up pruning of twigs and branches, deadheading flower and shrub blossoms, endless weeding and raking. I take off my work weary 'oh so worn out' gardening gloves, wash my dirty feet off with the garden hose, breathe a big sigh of relief that I finished today's chore list, and head inside to finish at least one of my many sewing projects. Summertime...it's hot and it's humid and it has so many, long, long days of hard work just to keep up with yard work but it still feels so wonderful to be outside, working so hard, and getting it all done.....bit by bit.....day by day. Georgette, Penelope, and Matilda..our chickens.... follow me wherever I go, hoping I will finally sit down in the lawn chairs in the shade of a big tree...knowing that if I do, that's when the red wheat grains come out in their red and white plaid topped jar and the treat time begins. Kermit, the cat, peeks out from the fern fronds with a gentle meow but is too lazy to move. That's how I want to be, laying around like a cat, being served special treats like the chickens, but there's always more to do, more to weed, more to water, more to pick, and don't forget to get the fresh eggs for the day. And you wouldn't believe me if I told you about all of my sewing projects inside...or maybe you would ;) Let's just say its been one of my most productive and busiest summers....ever! I hope your productive and busy summer is also enjoyable. Your work and efforts certainly have paid off - you have made a beautiful space! My sister now has two chickens! I can only enjoy the summer looking out a window. How sad is that? My allergies make me so ill, that sometimes, like now, even though I don't go outside I am still affected by the pollens and allergens. I suppose it is time to get retested. What a fun post to read -- thank you! I feel so lazy now! What a beautiful yard! Time to have something cold & enjoy the results.